It’s time to change your definition of value. 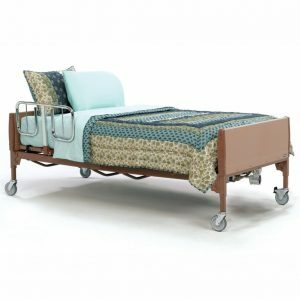 The Carroll CS Series CS5 Bed was developed for facilities requiring mobility at any height at a great value, and who appreciate the trademark Carroll CS Series Bed design elegance including the slat deck and tool-less assembly. 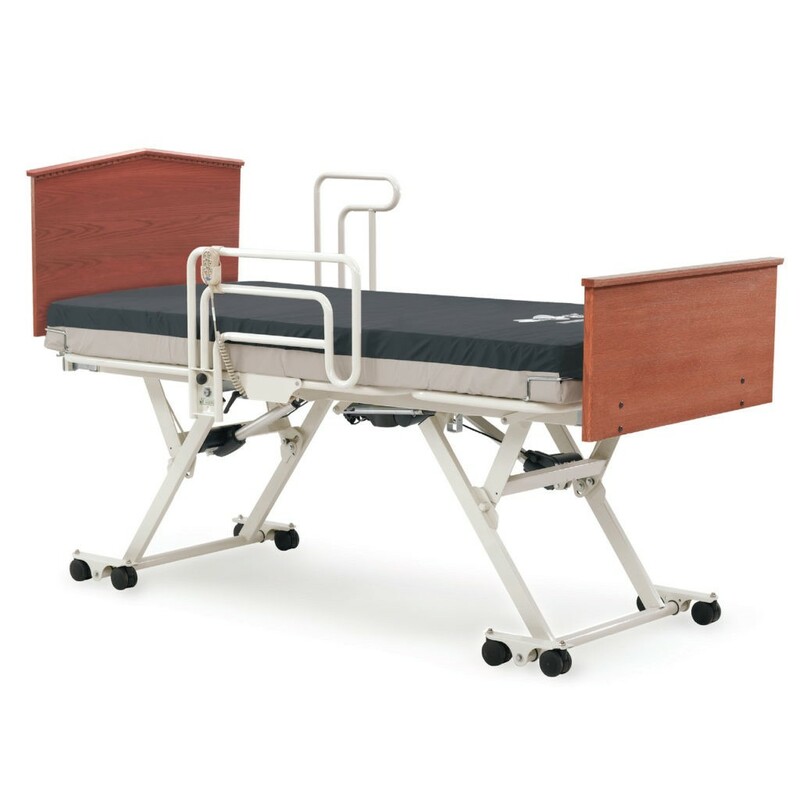 Hi Low Bed drops to 8.5″ height making it one of the lowest beds on the market and raises to 27″ at the highest setting. Ergonomic Hand Pendant: Water-resistant and rugged hand pendant designed to fit comfortably in the resident’s hand. Dual Pendant Connections: Pendant connects to either side of the bed, providing customized convenience for the resident. Pendant cord is attached to frame, and will not interfere with lifts or tables. Pure Vertical Rise: Raises straight up and down throughout the travel range, with zero horizontal movement of the casters minimizing potential damage to the wall or flooring. Mobility at any Height: The CS5 bed is mobile in any position providing convenience for the caregiver. Wall Bumper is included to ensure the bed is the proper distance from the wall for safe operation. 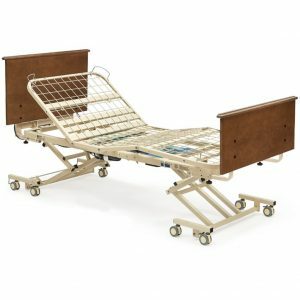 This mattress conforms to the patient’s body to provide support as the patient moves. Pressure Redistribution is achieved by using various cell depths throughout the mattress with special attention to the vulnerable heel section. Unique Pressure Zones: Channel cut high density polyurethane foam. 670 Individual cells offer superior pressure redistribution. Foam core is fire-retardant and anti-microbial/anti-bacterial. The cover is anti-microbial and anti-fungal, provides low moisture vapor transmission, is fluid resistant and has a 360 degree zipper for easy removal for cleaning. Size: 36” x 80” x 6” Weight Capacity: 300 lbs. 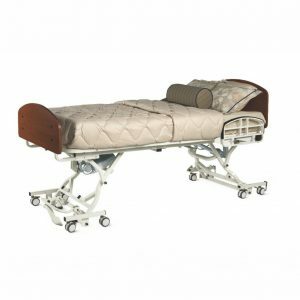 This mattress provides exceptional pressure redistribution for moderate to high risk patients with close attention paid to the sacral and heel area. 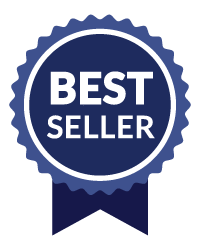 Contains multi-tiered pressure redistribution mattress with top layer of die-cut high density foam in the head & torso section. High-resilient foam in the heel section for unparalleled pressure redistribution. 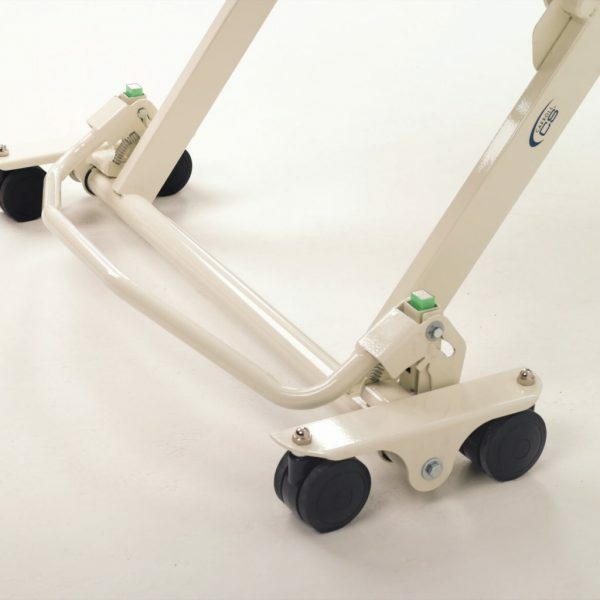 Patient transfer support system allows easy transfers by providing additional support around the edge. The 4-way stretch nylon cover reduces perspiration and provides a low shear friction surface that is anti-microbial and water resistant. Anti-Contamination Flap covers the zipper to reduce possibility of fluids ruining the foam core. 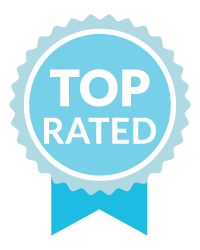 This mattress comes with the Visco Gel Polymer Technology (VGPT) that provides extraordinary pressure redistribution, rapid heat dissipation, and vast increases in breathability. VGPT is an open cell memory foam, infused with gel polymers, designed for clinical superiority and patient comfort. 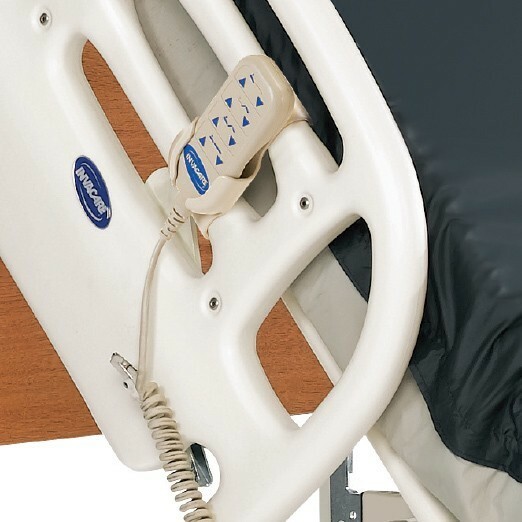 VGPT reduces occurrence of pressure sores, channels heat away from the body, provides more support with less cradling, eliminates static fatigue and keeps patients cool, dry and comfortable. This premium mattress uses a 30 degree heel slope to redistribute pressure. Comes equipped with a top layer of Lura-Quilt foam that keeps the skin cool and dry. Size: 36” x 80” x 6” Weight Capacity: 1,000 lbs. Heavy-duty, 1" powder-coated, welded steel construction for added durability. Three positions: Guard, assist and transfer to provide caregiver & user convenience. 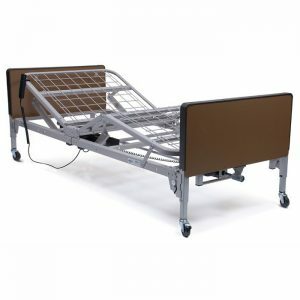 Provides coverage at the top of the bed then swings counter clockwise to the headboard of the bed and out of the way. Reliable, pinch-free latching mechanism for simplicity of use. These rails release down. Durable 7/8” chrome-plated side rails. Self-adjusting spring-loaded cross braces snap easily into place without tools for quick installation. Traditional styling that will fit any decor. Available in Amber Cherry, Solar Oak and Biltmore Cherry. Footboard Control Panel only available in Solar Oak and Biltmore Cherry. 1 to 3 Year In-Home Service Your homecare bed is eligible for up to three years of in-home service. 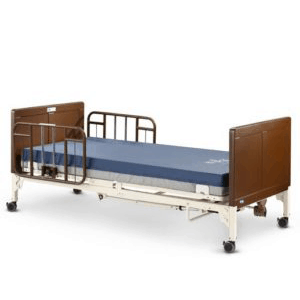 Should your bed ever need repair, simply call HomeCare Hospital Beds and we will dispatch an authorized service technician to your home to diagnose and repair your bed absolutely free of charge. In-home service on your bed means you’re covered for diagnostics, labor and repairs. Includes delivery of hospital bed to the front of your house or facility. This does not include bringing the hospital bed into the house. Assemble the bed in the room of your choice! Remove all boxes and packaging debris. Provide in-service instruction on proper use, maintenance and warranties! *Please note: Although we strive to have our technicians ready when you are, inside Set Up & Delivery may add 5-7 days to your delivery time! Bed Size: 36" or 42" x 80"